GREAT BEND, Kan. - Aug. 22, 2018 - PRLog -- EDUKAN, a consortium of Western Kansas community colleges, has announced a change in membership beginning with Fall 2018 enrollments. Formed in 1998 by a consortium of six colleges in Kansas, EDUKAN now will consist of four of the founding member schools. Colby Community College and Garden City Community College have announced they will leave the consortium as part of the pursuit of their individual strategic objectives. "EDUKAN has enjoyed 20 great years in partnership with both departing colleges. While we are sad to see them leave the consortium, we certainly wish them all the best and much success in the future," said Esther Lahargoue, EDUKAN's Chief Executive Officer. "EDUKAN remains committed to its continued growth and upward strategic trajectory." Lahargoue listed an increase in online student enrollment and further engagement in collaborative infrastructure resource management as priorities for the current academic year. In addition, the consortium looks forward to "the exciting endeavor of creating new partnerships, especially with colleges whose course offerings are diverse to those currently hosted by the organization," she said. "This expands our ability to provide more students with affordable and quality online education." As a pioneer in online education for rural Kansas, EDUKAN serves thousands of students a year, developed new technologies — from embedded books to save students money to online biometric security to identify the student when accessing learning materials and tests — and has been recognized by NUTN for excellence in technology. 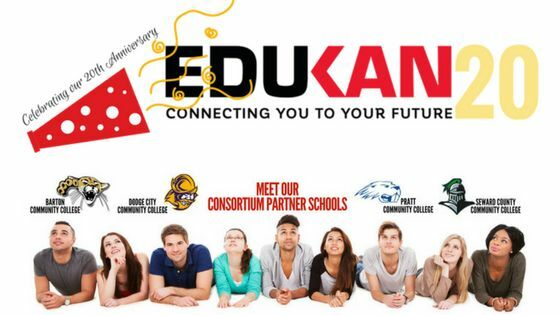 "EDUKAN aims to make a real difference in the lives of students in a way that aligns well with our core values of trust, integrity, valuing people, quality, and student success," said Dr. Ken J. Trzaska, president of member institution Seward County Community College and chairman of the EDUKAN Board of Presidents. "At Seward, we are always looking for ways to meet our students at their point of need, and we see EDUKAN as a key element in exploring options, working in collaboration with partner colleges in the state, and broadening our institution's reach in unique course offerings." EDUKAN continues to grow in enrolled students both in the United States and Internationally, as students seek out low-cost tuition, accessibility, embedded books and course options. The system has proven appealing to those who wish to earn an Associate Degree for less than $10,000, a remarkable value in light of ever-increasing college tuition prices. Committed to continued innovation and growth, EDUKAN looks forward to new opportunities to partner with other schools and in support of member schools. EDUKAN provides access to quality, affordable, higher education online courses for students pursuing college degrees, certificates or individual courses. Founded in 1998, EDUKAN helps students who are returning to complete a degree, high school students who want to earn early college credit, students who need a flexible schedule or specific courses to complete their degree path, or people considering a career change. All EDUKAN courses are accredited through the consortium of Kansas learning institutions with excellent reputations and long histories helping students achieve their educational goals. EDUKAN Consortium member institutions are: Barton Community College in Great Bend; Dodge City Community College; Pratt Community College; and Seward County Community College in Liberal. For more information, please visit http://www.edukan.org.